Mouthwash and Toothpaste: Use 3% H2O2 to spray on your toothbrush and brush your teeth with it. Rinse with water. Or, take one capful (the little white cap that comes with the bottle) and hold in your mouth for 10 minutes a few times a week, then spit it out. No more canker sores and your teeth will be whiter without expensive pastes. Use it instead of mouthwash. Cuts and Abrasions: Spray 3% H2O2 on minor sores and they heal faster. Cleaning the Ears: Spray an organic cotton swab with 3% H2O2 and gently clean all surfaces of the ears. Vegetable Soak: Add half a cup of 3% H2O2 to a full sink of cold water. Wash your vegetables in it to kill bacteria and neutralize chemicals. To Freshen Your Kitchen: Keep a spray bottle of 3% in the kitchen. Use it to wipe off counter tops and appliances. It will disinfect and give the kitchen a fresh smell. In the Dishwasher: Add 2 oz of 3% H2O2 to your regular washing formula. Sprouting Seeds: Add 1 oz 3% H2O2 to 1 pint of water and use each time you rinse the seeds. House and Garden Plants: Put 1 oz 3% H2O2, one teaspoon MSM, and 3 drops Ocean's Alive Marine Phytoplankton (item #0611) in 1 quart water. Water or mist plants with this solution. Humidifiers and Steamers: Mix 1 pint 3% H2O2 to 1 gallon of water. Laundry: Add 3% H2O2 to your wash in place of bleach. Facial: Use 3% H2O2 as a spray facial freshener after washing. Keep eyes closed. Gently exfoliate skin. - Let your toothbrushes soak in a cup of peroxide to keep them free of germs. - Clean your counters, table tops with peroxide to kill germs and leave a fresh smell. Simply put a little on your dishrag when you wipe, or spray it on the counters. - After rinsing off your wooden cutting board, spray peroxide on it to kill salmonella and other bacteria. - For foot fungus - spray a 50/50 mixture of peroxide and water on them (especially the toes) every night and let dry. - Soak minor infections or cuts in 3% peroxide for five to ten minutes. - Fill a spray bottle with a 50/50 mixture of peroxide and water and keep it in every bathroom to disinfect without harming your septic system like bleach or most other disinfectants will. - Tilt your head back and flush your nostrils with 50/50 peroxide/water mixture whenever you have a cold, plugged sinuses or sinus infection (great for use in neti pots). It will bubble and help to kill the bacteria. Hold for a few minutes then blow your nose into a tissue. - If you have a terrible toothache and cannot get to a dentist right away, put a capful of 3% peroxide into your mouth and hold it for ten minutes several times a day. The pain will lessen greatly. - If you like a natural look to your hair, spray with 50/50 peroxide/water solution on your wet hair after a shower and comb it through. You will not have the peroxide "fried blonde" hair like the hair dye packages, but more natural highlights. It lightens gradually so it's not a drastic change. - Put half a bottle of peroxide in your bath to help rid boils, fungus, or other skin infections. - You can also add a cup of peroxide instead of bleach to a load of whites in your laundry to whiten them. If there is blood on clothing, pour directly on the soiled spot. Let it sit for a minute, then rub it and rinse with cold water. Repeat if necessary. - Use peroxide to clean mirrors - there is no smearing. 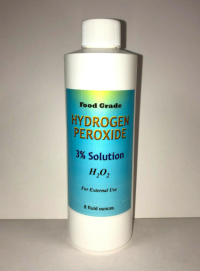 - Gargle with hydrogen peroxide, put drops in the ear and nose to assist with colds, flu, chronic sinusitis (including polyps), and infections. - Disinfect your dishwasher or refrigerator. - Use it on trees and plants as a natural fungicide, insecticide, and as a weed killer. - Clean with hydrogen peroxide if your house becomes invaded by toxic mold (such as after water damage). 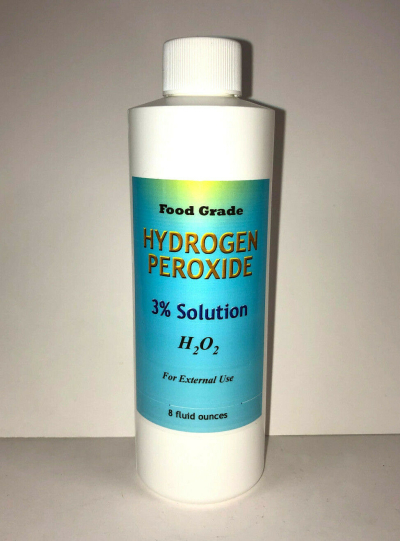 Ingredients: 3% Solution of FCC, USP Food Grade Hydrogen Peroxide in Triple UV Filtered Deionized Water.